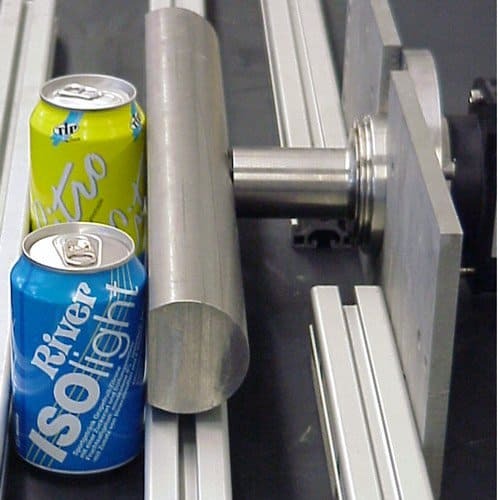 Hielscher ultrasound is being used in bottling and filling machines for the on-line container leak testing of bottles and cans. 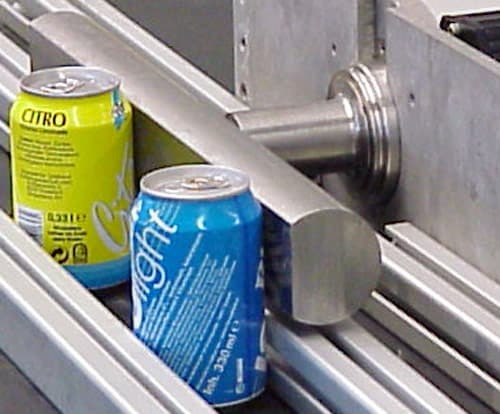 The instantaneous release of carbon dioxide is the decisive effect of ultrasonic leakage tests of containers filled with carbonated beverages. Carbonated drinks, such as soda and beer have a high concentration of dissolved carbon dioxide. The ultrasound will increase the speed of degassing significantly. In the case of carbonated drinks the CO2 will almost instantaneously form bubbles and rise to the surface. This effect results in a rapid rise in pressure inside the closed can or bottle. The pressure rise leads to an immediate escape of liquid, if the container is not leak-proof. With level or pressure control systems the leaking cans or bottles can be removed afterwards. 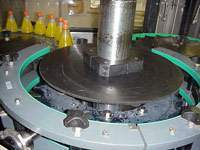 For a leakage test an ultrasonic processor with a unique bar sonotrode is integrated in the filling machine, in that way, that the cans or bottles are moved along the sonotrode. A pressure appliance mounted opposite to the sonotrode generates the pressure to the cans or bottles to the sonotrode, that is necessary for the ultrasonic excitation. This pressure appliance can consist of brushes, plastic foam, leaf springs etc. The beverage is excited indirectly via the wall of the can or bottle. Each filling machine can easily be retrofitted on account of this simple construction of the ultrasonic systems. With customized designs of the sonotrode the ultrasonic system can be adjusted to different space conditions. As this is not an ultrasonic bath, the container will not get wet. Hence there is not problem of drying. The ultrasonic sonotrode can be either straight or curved to fit into your machine. Please click at the images below to see the various principles. Ultrasonic tanks are commonly used container integrity testing. In such a setup, the bottles or cans are being immersed into an ultrasonic tank filled with water. The ultrasonic vibrations are transmitted to the container wall by means of the surrounding water. One major problem results from beverage leaks and spills. The beverage will mix into the water and contaminate the outside surfaces of all immersed containers. Besides the impact on the optical appearance of the containers, there is a serious impact on the consumer safety. Beverage residues on the container will lead to microbial growth and mildew during storage and transportation. Although clear water rinsing reduces this problem, contamination at the container bottom is typically not rinsed off. Hence the problem persists. The use of the bar sonotrode eliminates the immersion of the containers into a tank. Therefore, it avoids the container contamination. This leads to improved product safety. Hielscher offers you the ultrasonic devices with sonotrodes for the integration into on-line container leak testing equipment. You will need additional means for detecting leaks, e.g. level detection or liquid spray detection. Hielscher does not offer complete leak detection systems. If you are a machine manufacturer you can get OEM units for the system integration.